The Cabrillo Boulevard Bridge, built in 1913, is set for replacement over the next two years. 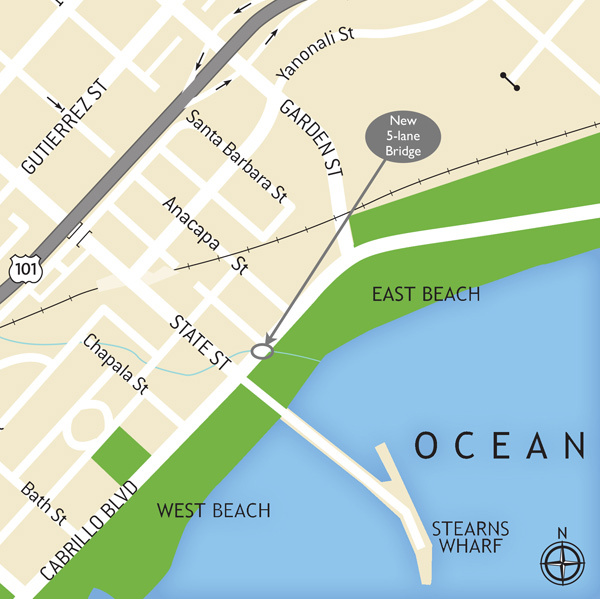 At the bottom of State Street along Cabrillo Boulevard, the seaward flow of Mission Creek has crossed under both roads and the Cabrillo Boulevard Bridge since 1913. The bridge, largely invisible due to the restaurant and road built atop parts of it, has loomed large in the city’s Capital Fund, mainly because it supports a highly trafficked part of the waterfront. 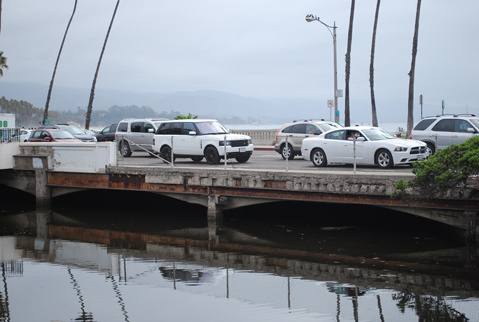 Beginning this week, Lash Construction will be replacing the bridge in a two-year project split into three sections in order to keep at least one lane of Cabrillo Boulevard open at all times. Map shows location of bridge work over Mission Creek. In the project’s second stage, which begins in spring 2015, the mountain side of the bridge will be replaced, and Helena Avenue at Cabrillo will be temporarily closed. Automobile, bicycle, and pedestrian access on the beach side will remain. During the last phase — in which the beach side of the bridge will be replaced — motorists and other passersby can use the newly built side of the bridge as well as a temporary path along the beach. Left turns onto Stearns Wharf from Cabrillo will be temporarily suspended. The $26 million project rebuilds the bridge to meet modern earthquake and vehicle safety standards. The bridge design also improves the water flow in Mission Creek, reduces the risk of flooding, and is expected to create new habitat for steelhead trout and tidewater gobies, both species of fish on the federal endangered list. A majority of the funding was awarded in a federal Highway Bridge Program grant.